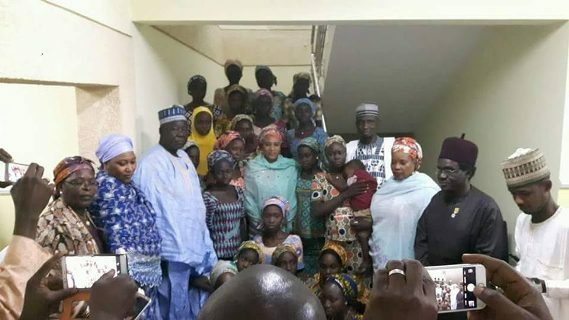 Latest news on the released 21 Chibok girls just in.A delegation from Borno, led by wife of the state Governor, Hajiya Nana Shettima, on Monday, October 24th, visited the 21 Chibok schoolgirls who were recently from Boko Haram captivity. Speaking during the visit in Abuja, Hajiya Nana Shettima said the release of 21 abducted Chibok schoolgirls made her the happiest woman on earth, commending President Muhammad Buhari and other parties, whose roles led to the release. "We are here to express our gratitude to God Almighty for sparing your lives up to this moment. You have tasted the bitter experience in life, but I can assure you that Government will do everything possible to turn your fortunes for the better. I and my husband Governor Kashim Shettima are the happiest people. I can recall our bitter experience after the abduction took place at your school in Chibok." In his remarks, the Secretary of Borno Elders Forum, Dr. Bulama Mali Gubio who was part of the delegation, urged the security agencies to quickly allow the released girls to reunite with their parents. Speaking on behalf of the girls, Miss Rubecca Mallum thanked Mrs. Shettima and other members of the delegation for the visit.